An en:ontological argument for the existence of God attempts the method of a priori proof, which uses intuition and reason alone. The argument examines the concept of en:God, and states that if we can conceive of the greatest possible being, then it must exist. In the context of the en:Abrahamic religions, ontological en:arguments were first proposed by the Medieval philosopher en:Anselm of Canterbury (in his en:Proslogion). Important variations were developed by later philosophers like en:René Descartes, en:Gottfried Leibniz, en:Norman Malcolm, en:Charles Hartshorne, and en:Alvin Plantinga. A modal-logic version of the argument was devised by the mathematician en:Kurt Gödel. The differences among the argument's principal versions arise mainly from using different concepts of God as the starting point. Anselm, for example, starts with the notion of God as a being of which no greater can be conceived, while Descartes starts with the notion of God as being totally perfect, and Leibniz with something having all "perfections". The ontological argument has been a controversial topic in philosophy. Many philosophers, including en:Gaunilo of Marmoutiers, en:St. Thomas Aquinas, en:David Hume, en:Immanuel Kant, en:Gottlob Frege and en:Bertrand Russell, have openly criticized it. 4.3 Criticism by "existence precedes essence"
The argument may have been implicit in the works of Greek philosophers such as en:Plato, and the en:Neoplatonists. The mainstream view is that the ontological argument was first clearly stated and developed by en:St Anselm. Some scholars have argued that the Islamic philosopher en:Avicenna (Ibn Sina) developed a special kind of ontological argument before Anselm; however this is doubted by most scholars on the subject. en:Anselm of Canterbury was the first to attempt an ontological argument for God's existence. The ontological argument was proposed by en:Anselm of Canterbury (en:1033–en:1109) in the second and third chapter of his en:Proslogion. Anselm's basic argument in Chapter 2 of the Proslogion goes as follows. When we hear the words "that than which a greater cannot be thought", we understand what the words convey, and what we understand exists in our thoughts. This then exists either only in our thoughts or both in thought and reality. But it cannot exist only in our thoughts, because if it existed only in our thoughts, then we could think of something greater than it, since we could think of something than which a greater cannot be thought that exists both in thought and in reality, and it is a contradiction to suppose we could think of something greater than that which nothing greater can be thought. Hence, that than which a greater cannot be thought exists both in thought and in reality. Therefore, that than which a greater cannot be thought really does exist, and in later chapters of the Proslogion Anselm argues that this being has the traditional attributes of God like being the omnipotent creator. In Chapter 3 of the Proslogion, Anselm brings in the notion of a being that cannot be conceived not to exist, which is similar to the notion of a necessary being. He argues that if x is such that x can be conceived not to exist, then x is not that than which nothing greater can be thought. Consequently, that than which nothing greater can be thought cannot be conceived not to exist. This can be read either as a gloss on the argument in Chapter 2, or as a new (and superior according to Malcolm) version of the argument, or as the first of Anselm's derivations of divine attributes from the concept of the maximally great being, in this case the attribute of necessity. French thinker en:René Descartes composed several arguments that could be termed ontological. en:René Descartes (en:1596–en:1650) composed a number of ontological arguments, which differed from Anselm's formulation in important ways. Generally speaking, it is less a formal argument than a natural intuition. But if the mere fact that I can produce from my thought the idea of something that entails everything which I clearly and distinctly perceive to belong to that thing really does belong to it, is not this a possible basis for another argument to prove the existence of God? Certainly, the idea of God, or a supremely perfect being, is one that I find within me just as surely as the idea of any shape or number. And my understanding that it belongs to his nature that he always exists is no less clear and distinct than is the case when I prove of any shape or number that some property belongs to its nature (AT 7:65; CSM 2:45). Whatever I clearly and distinctly perceive to be contained in the idea of something is true of that thing. I clearly and distinctly perceive that necessary existence is contained in the idea of God. The ontological argument received much criticism and was rejected by en:St Thomas Aquinas, and therefore by some Catholic theologians. It has also received its share of criticism from non-Christians: en:Bertrand Russell noted that "The argument does not, to a modern mind, seem very convincing, but it is easier to feel convinced that it must be fallacious than it is to find out precisely where the fallacy lies." Conversely, during his early Hegelian phase, Russell is also known to have said: "Great God in Boots! -- the ontological argument is sound!" The first objections were in the form of parodies, such as Gaunilo's Island, but some believe en:Immanuel Kant to have finally settled the matter with his famous rejection of existence as a property. Others believe that existence is indeed a property and that, if the proof is fallacious, the fallacy must lie elsewhere. One of the earliest recorded objections to Anselm's argument was raised by one of Anselm's contemporaries, en:Gaunilo of Marmoutiers, who invited his readers to conceive of the greatest, or most perfect, island. As a matter of fact, it is likely that no such island actually exists. However, his argument would then say that we are not thinking of the greatest conceivable island, because the greatest conceivable island would exist, as well as having all those other desirable properties. Since we can conceive of this greatest or most perfect conceivable island, it must exist. Such objections are known as "Overload Objections"; they do not claim to show where or how the ontological argument goes wrong; they simply argue that, if it is sound, so are many other arguments of the same en:logical form that we do not want to accept, arguments that would overload the world with an indefinitely large number of necessarily existing perfect islands, perfect lizards, perfect pencils and the like. The main problem with the ontological argument is that the final operation creates a contradiction between the two statements that are supposed to be equivalent. One assumes and the other implies. These are not equivalent and the operation is invalid. There is a possible answer to this objection, put forward by the Roman Catholic philosopher Paul J. Glenn (who himself disagreed with the proof on other grounds) in his An Introduction to Philosophy. [փա՞ստ] It is that Anselm's argument is only applicable to a being of which nothing greater can be conceived. Therefore, the island analogy is not appropriate, as it has only limited application (islands). The supreme being is not merely a platonic form, but a unique God who necessarily exists because his greatness is limitless. Islands are by definition limited; they need not have every greatness. God, to be God, must have. And so this proof could only apply to the greatest being possible. en:St. Thomas Aquinas, while proposing five proofs of God's existence, objected to Anselm's argument. He argued that, since the essence of God is his existence, the ontological argument would only be meaningful to someone who knew the essence of God completely. Since only God could completely know his own essence, only God can use the ontological argument to prove his own existence to himself. en:Mulla Sadra argued that reality is existence, differentiated in a variety of ways, and these different ways look to us like essences. What first affects us are things that exist and we form ideas of essences afterwards, so en:existence precedes essence. This position is referred to as "primacy of existence" (պարս․՝ اصالت وجود, արաբ․՝ أصالة الوجود‎‎). en:David Hume did not believe an ontological argument was possible. [T]here is an evident absurdity in pretending to demonstrate a matter of fact, or to prove it by any arguments a priori. Nothing is demonstrable, unless the contrary implies a contradiction. Nothing, that is distinctly conceivable, implies a contradiction. Whatever we conceive as existent, we can also conceive as non-existent. There is no being, therefore, whose non-existence implies a contradiction. Consequently there is no being, whose existence is demonstrable. Though this criticism is directed against a cosmological argument similar to that defended by en:Samuel Clarke in his first en:Boyle Lectures, the point applies to ontological arguments as well. However, Hume's criticism, when applied to the ontological argument, is generally seen as question begging, since his claim, that there is no being whose non-existence implies a contradiction, is precisely the claim in question; the ontological argument is an attempt to demonstrate that there is a being whose non-existence implies a contradiction. Hume's claim, as directed to the cosmological argument, cannot be used, therefore, to adequately respond to the ontological argument, since it affirms what is at question. en:Immanuel Kant put forward a key refutation of the ontological argument in the en:Critique of Pure Reason (first edition, pp. 592–603; second edition, pp. 620–631). It is explicitly directed primarily against en:Descartes but also against en:Leibniz. His criticism was anticipated in en:Pierre Gassendi's Objections to Descartes' Meditations. 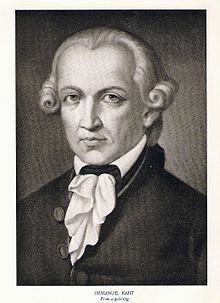 Kant's refutation consists of several separate but interrelated arguments. They are shaped by his central distinction between analytic and synthetic judgments. In an analytic judgment, the predicate expresses something that is already contained within a concept and is therefore a tautology; in a synthetic judgment, the en:predicate, or claim, links the concept to something outside it that is not already logically implied by it. New knowledge consists of synthetic judgments. The typical response (e.g., Plantinga's ontological argument, below) to this objection to the ontological argument is this: "While 'existence' simpliciter cannot be a predicate, 'necessary existence' (like 'contingent existence') can be a predicate." Some things are contingently so, and some things are necessarily so. God, it is said, is a necessary being en:de re. Some have objected that Plantinga's argument merely re-assumes that existence is a property and continues the argumentation by tautology. en:Graham Oppy, a scholar on the ontological argument, isn't particularly impressed with this parody. Writing in the Stanford Encyclopedia of Philosophy, he is mainly concerned with the first premise, asking "what reason is there to believe that the creation of the world is 'the most marvelous achievement imaginable.' Gasking was apparently thinking of the "world" or "universe" as the same as "everything." If one is willing to accept the first premise, it seems that one has no choice but to accept the fourth premise (although the validity of #3 is questionable). Thus, the philosophical point of this parody is to highlight problems when existence is taken as property: "whereas Anselm illicitly supposed that existence is a perfection, [Gasking] is illicitly invoking the inverse principle that non-existence is a perfection." Classical theism states that God is en:omnipotent, en:omniscient, and en:omnibenevolent. Ontological arguments proving the existence of such a God depend, explicitly or implicitly, upon these terms being meaningful in themselves and able to be jointly asserted coherently. Leibniz, who supported the ontological argument, especially as reformulated by Descartes, asserted that the argument "assumes something that must still be proved in order to render it mathematically evident; that is, it is tacitly assumed that this idea of the all-great or all-perfect being is possible, and implies no contradiction." This problem does not disprove the argument, but asserts that the possibility of God's existence, which is necessary to the argument, must be proven before the argument can be accepted. Կաղապար:Quotebox Obviously St. Anselm thought this argument was valid and persuasive, and it still has occasional defenders, but many contemporary philosophers believe that the ontological argument, as St. Anselm articulated it, does not stand up to strict logical scrutiny. Others, like en:John Duns Scotus, en:Gottfried Leibniz, en:Norman Malcolm, en:Charles Hartshorne, en:Kurt Gödel, and en:Alvin Plantinga, have reformulated the argument in an attempt to revive it. Another notable reformulation is offered by en:Iris Murdoch. She takes it that St. Anselm's argument, while not a proof of the existence of God, is a demonstration of the necessary existence of the Good. Among Muslim philosophers en:Mulla Sadra (c. en:1571–en:1640) has criticized Avicenna's argument and discussed that it is not an a priori argument. He also rejects that argument on the basis that en:existence precedes essence. He then put forward a new argument. Mulla Sadra put forward a new argument, known as Argument of the Righteous (արաբ․՝ البرهان الصديقين‎‎ — Al-Burhan al-Siddiqin). This strives to prove the existence of God through the reality of existence, and to reach belief in God's pre-eternal necessity. In this argument, a thing is demonstrated through itself, and a path is identical with the goal. In other arguments, the en:truth is attained from other than itself, for example from the possible to the necessary, from the originated to the eternal origin, or from motion to the unmoved mover. But in the argument of the righteous, there is no middle term other than the truth. Existence is a single, objective and simple reality, and there is no difference between its parts, unless in terms of perfection and imperfection, strength and weakness… And the culmination of its perfection, where there is nothing more perfect, is its independence from any other thing. Nothing more perfect should be conceivable, as every imperfect thing belongs to another thing and needs to become perfect. And, as it has already been explicated, perfection is prior to imperfection, actuality to potency, and existence to non-existence. Also, it has been explained that the perfection of a thing is the thing itself, and not a thing in addition to it. Thus, either existence is independent of others, or it is in need of others. The former is the Necessary, which is pure existence. Nothing is more perfect than Him. And in Him there is no room for non-existence or imperfection. The latter is other than Him, and is regarded as His acts and effects, and for other than Him there is no subsistence, unless through Him. For there is no imperfection in the reality of existence, and imperfection is added to existence only because of the quality of being caused, as it is impossible for an effect to be identical with its cause in terms of existence. Therefore (by en:axiom S5) it is necessarily true that an omniscient, omnipotent and perfectly good being exists. This argument has two controversial premises: The en:axiom S5 and the "possibility premise" that a maximally great being is possible. The more controversial of these two is the "possibility premise" since S5 is widely (though not universally) accepted. Paul Almond strongly disagrees with the argument based on the "incoherence, incorrectness and triviality" of en:axiom S5 . One objection by Richard M. Gale, professor emeritus of philosophy at en:University of Pittsburgh, is that the "possibility premise" en:begs the question, because one only has the epistemic right to accept it if one understands the nested modal operators, and if one understands them within the system S5 (without which the argument fails) then one understands that "possibly necessarily" is basically the same as "necessarily". There are, nonetheless, other approaches to the possibility premise. Leibniz thought that the possibility premise followed from the claim that "positive qualities" could not logically conflict with one another, and hence the notion of a being that had all the positive qualities had to be coherent. en:Gödel's ontological proof uses similar ideas. A very different approach has recently been attempted by Alexander R. Pruss, currently of en:Baylor University. He starts with the 8th–9th century AD Indian philosopher en:Samkara's dictum that if something is impossible, then we cannot have a perception (even a non-en:veridical one) that it is the case. Contraposing, it follows that if we have a perception that p, then even though it might not be the case that p, it is at least the case that possibly p. If mystics in fact perceive the existence of a maximally great being, it follows that the existence of a maximally great being is at least possible. And that is all that is needed to get the modal ontological argument off the ground. One difficulty in this argument is that one might misinterpret the content of one's experience, and hence the mystic might be incorrect even in a cautious description of an experience as an experience "as of a maximally great being." Another problem would be if one could have an experience as of a universe that is uncreated, eternal and godless (i.e., devoid of a maximally great being), which, if experienced, must be possible, therefore breaking the necessity of said maximally great being. ↑ Malcolm, N. "Anselm's Ontological Arguments", Philosophical Review, 69 (1960) 41–62. ↑ en:Aquinas, Thomas, Saint. en:Summa Theologica, Part 1, Question 2, Article 1. ↑ Autobiography of Bertrand Russell, vol. 1, 1967. ↑ Cottingham John (1986)։ Descartes։ Blackwell Publishing։ էջ 62։ ISBN 0631150463 In the context of Descartes' formulation and offering other examples, Cottingham defines the term "overload objection" as used in the current article. ↑ Gale Richard (1993)։ On the Nature and Existence of God։ Cambridge University Press։ էջ 227։ ISBN 0521457238 "While it seems clear [the possibility premise] begs the question, there remains the larger question if it is true." That is, if the argument doesn't try to prove the existence of God, but is used to justify that religious belief is "epistemically permissible", then the discussion is more complicated. Jori, Alberto, 'Die Paradoxien des menschlichen Selbstbewusstseins und die notwendige Existenz Gottes — Zu 'Cogitatio' und 'Intellectus' im Streit zwischen Anselm und Gaunilo', in: C. Viola and J. Kormos (ed. ), Rationality from Saint Augustine to Saint Anselm. Proceedings of the International Anselm Conference — Piliscsaba (Hungary) 20–23 June 2002 (Piliscsaba 2005), pp. 197–210. Freddoso, Alfred J. "The Existence and Nature of God". The Ontological Argument. Univ of Notre Dame Pr, 1983. Mulla Sadra’s Argument of the Righteous and a Critical Study of Kant and Hume’s Views on the Proofs of God’s Existence by Hamid Reza Ayatullahi. Brown, Paterson. "Professor Malcolm on Anselm's Ontological Arguments", Analysis, 1961.